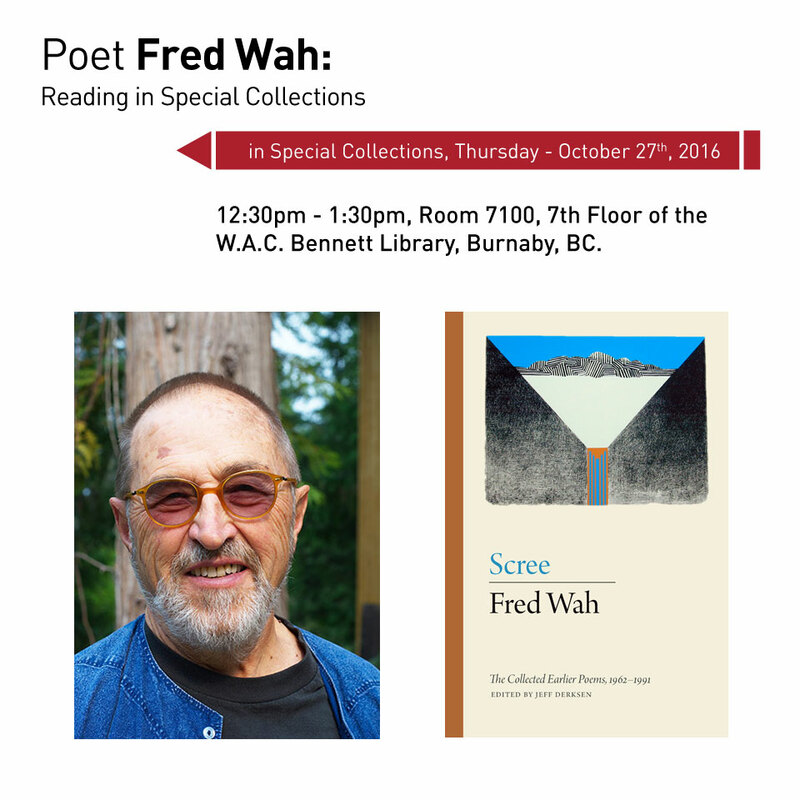 Renowned local poet Fred Wah will be reading at Simon Fraser University Library's Special Collections & Rare Books on Thursday, October 27, 2016 from 12:30 – 1:30 pm. Born in 1939 in Swift Current, Saskatchewan, Fred Wah grew up in Nelson, B.C. His long career has spanned six decades and a range of formal styles and preoccupations. In the early 1960s, while attending the University of British Columbia, Wah was a founding editor of the influential avant-garde poetry newsletterTISH and a member of the group of student-writers who gathered around the magazine, including several who went on to distinguished careers—George Bowering, Frank Davey, Daphne Marlatt, among others. Since that time Wah has established himself as an important figure on the post-modern literary scene in Canada, as writer, editor and teacher. His work has received numerous awards, including the B.C. Book Prize and the Governor General’s Award. For many years he taught at the David Thompson University Centre, Selkirk College, the University of Calgary, and the Banff Centre. He has been writer-in-residence at a number of Canadian universities and colleges, including SFU in 2007/08. In 2011 he was appointed as Canada’s fifth Parliamentary Poet Laureate, and in 2013 he was made an Officer in the Order of Canada. Recently Talonbooks collected the poet’s early poems in a large volume titled Scree, edited with an introduction by Jeff Derkson of SFU English, who will also introduce the reading. Special Collections is located in room 7100 on the 7th floor of the W.A.C. Bennett Library, Simon Fraser University, 8888 University Drive, Burnaby.